We live on 2 acres. 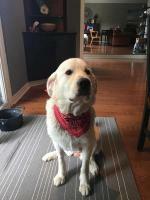 Our Great Pyrenees was roaming the neighborhood and the neighbors didn't like him. He was stealing dog bowls and shoes to name a few. He was a very happy dog and full of love. We gave him to my sister, who lived in the country. She had eye surgery and wasn't home to care for him so she took him to her granddaughters who had bulldogs and other dogs. They said he snapped at one of the children. While they had him they cut his hair. They have now brought him back to us. Could this hair cut be part of the problem???? He is not the same dog. Doesn't act right at all. He is panting and slobbering, but it it very hot out. We have to put him on a run line (which we don't like). My husband is worried he has rabies. He had a rabies shot when we had him, but we don't remember when we gave it. He is over a year old now. He acts like he may have been abused. He won't let me comb him near his behind. When I went to get him at my nieces he pawed at me and I was unable to load him. He is huge now and more than I can handle. However today he let me lead him to the front lawn and hook him to a line. He was on a line in the back yard and broke or chewed the cable in two. I know he is board and we really do love this dog. We just can't keep him here. We thought he would love being with my 3 nieces, that he would get plenty of love, but we are afraid for him to be there now since he growled and snapped at one of them. This morning he acted more like himself. He wasn't slobbering, but I had to leave him home for the day. Yesterday was extremely hot, but it will be 100 again today. I feel better about him, but would still like any input. It concerns me that they tried to cut his coat off. Could that be why the heat seems to bother him more? I had heard that you just comb them and don't use clippers??? We got him to guard our chickens. We lost all of them while he was still a pup. We now have guineas, but haven't kept him in the pen with them. I was reading that some of you keep them in doors. Is this common? Could I make him a house dog at this point? Goodness me, your poor pup has been thru a lot! And he's still a pup even tho he's BIG. He left 2 homes when his caregiver became ill. This would stress a dog that is bred to protect the small and weak. Then in his 3rd place he was confronted with multiple other dogs and children with high voices. More stress. They cut his hair?? MORE stress. So you now have him back home, and tie him up and wonder what's wrong with him? Do you walk him? If he is your pet does he ever come into your home...be with you...get loved? He's become anxious and no doubt reactive at times also. No fault of his own. This poor dog needs a life and you aren't giving him one. 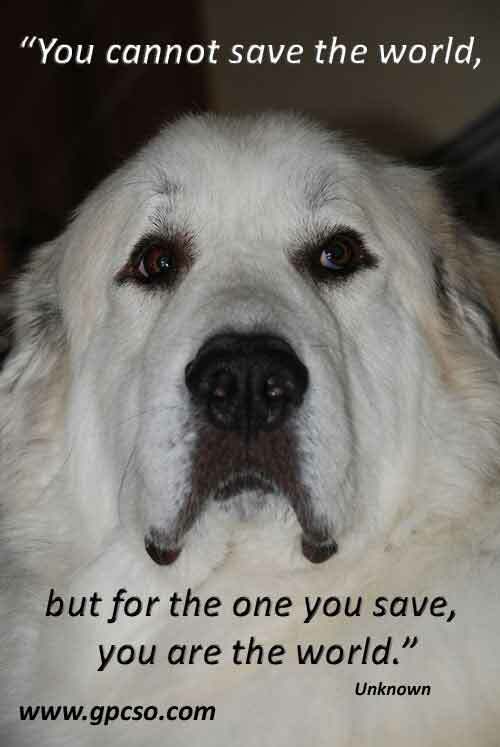 If you are not willing to do for him what needs to be done to help him feel secure and trusting once more, then you had better call a Pyr Rescue group near to where you are. Relinquish him for his sake as he cannot go back to either of your previous choices of re-homing. Poor puppy!! 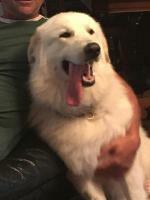 The Pyr developed his coat for protection in cold and hot climates. Its taken them hundreds of years to perfect this state of the art coat. Cutting it has taken from him that natural protection, he feels that both physically and emotionally. They pant and drool to cool off, not because he's sick. He needs to be exercised during the cool hours of the day, given fresh water and a place to lay down where its cool. Ours heads for the basement on hot days. Given the chance, they know what to do. He's been through a lot in the past while, and has been traumatised by all that. Give him good consistent care, take him for leashed walks to he can check out the neighbourhood for varmints, bring him indoors to be with you. He needs to know he's safe and secure and loved. Good luck. Sorry to sound mean but it sounds like you did not do your homework to understanding this breed. The dog is confused and angry, he is supposed to protect you that's what he only knows and for somebody to shave their hair OMG so wrong! They have two layers of fur and God gave it to them for a reason! It's not for humans to take it off because they can't deal with it. Yes they slobber all the time and when they're stressed they slobber more. I don't think he trusts you anymore you have shipped them around like it's somebody's leftover dinner that's not how they work they are incredibly loyal. I feel sorry for him, he's confused. READ UP ON THE BREED! They are unique in personalities! They are roamers, checking out the area, protecting you! There seem to be a number of issues in your post. I am focusing on your last paragraph. You love your dog. Pyrs need to have a fenced-in yard for a number of reasons. You could fence in all of your yard or a large part of it. That way your dog won't roam and bother your neighbors, and he can also get some exercise, and he will be safe. Your dog may have nipped at one of the children because he was feeling stressed at being moved around. Also, young children always need to be watched around dogs -- any dogs. I wish you all the best and hope that you will be able to keep your dog and have a great life together. Did they shave him? You never shave a Pyr (double-coated dog). This is his insulation from the heat and cold. Dogs pant and sweat through their pads to keep cool. They generally become upset when this happens. What was your niece doing that made him growl? This is important to know. Growling is good. This is a warning to tell whomever that they don't like what that person is doing to him. If this is a child, they must be respectful of all creatures. Always respect a growl. It's nothing to be afraid of but to respect. Take your dog to a vet for a check over to determine if he has a health issue. Did you ask what happened at your sister's that has changed your dog's behaviour? 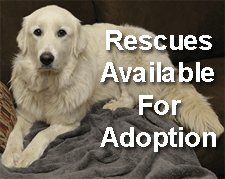 Did you do your research before you got a Pyr? They do become big. With proper training and socialization, their size should not be an issue. Pyrs should not be on tie-outs since they cannot have full access to their property for watching over. They should have at least 6-foot secure fencing so you should consider building one. Pyrs do roam as this is their nature. 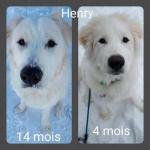 That is why they are used as guardian livestock dogs. They roam while watching over their charges. Bring in a positive-reinforcement trainer to show you how to work with your dog. Wow – hard to know where to begin. Several people have already given you excellent insight and sound advice. I will add my voice to theirs. First priority, overheating, panting, etc. As already mentioned severe panting is a sign of anxiety and/or overheating. Given that he was shaved and with the temperatures you are describing, it’s a good bet that this poor guy is seriously overheating. The Pyr coat acts as an effective insulator from winter’s chill and summer’s heat. Without it, his body is going to have a difficult time regulating his body temperature. Ideally he should be indoors during the heat of day, in an air conditioned room that is set at a comfortable level, not too cold. Somewhere between 65 – 70F would do. Combination of panting and slobbering does point to anxiety, but can also indicate overheating. The history you’ve given would be consistent with a now insecure, anxious and confused dog. The pawing I interpret as "HELP – get me outta here!" Back to basics. Pyrs live to guard/protect. That will tell you everything about their nature and basic needs. In order to effectively guard his territory, which extends as far as the eye can see, he feels a strong compulsion to move, to wander. Hence, the only way to keep a Pyr safe is in a secured fenced-in area when outdoors. Having him tethered is pure torture and frankly, just plain cruel. Now back to the concept of guarding. He needs to establish who his charges are, which generally would be the livestock/poultry he is responsible for. No flock to guard? Then the family becomes the flock. Not extended family, not neighbours, not friends of the family’s kids, not visitors, certainly not strangers. The immediate family, which includes whoever is living there, including other critters. That’s it! PERIOD. This poor dog has no idea who his flock is. This is the point where you have to decide whether you want him as a house dog or a guardian for your guinea fowl? While possible, few dogs can live comfortably in both worlds. You have a lot of work to do to win back this dog’s trust. It may take weeks, it may take months or even years, depending on how much damage has been done, and how committed you are to fixing things. •Do not, do not, do not tether him. •Do not allow children, well-meaning friends or anyone outside of your immediate family (veterinary professionals would be the exception) to approach, in other words bother him. •Find a cool comfortable place for him to stay, away from the heat of day. •Feed and walk him exactly the same time each day. •Leave his hind end alone until you regain his trust. Just read your update this AM, and am relieved for him he seems a bit improved. However, there are some very serious gaps in your knowledge of Great Pyrenees dogs and you seem to not have reacted to his situation with much common sense being used. I do wonder at this point how much experience you have with working dogs, Pyrs in particular. Any dog is not "just an animal"...if he is in your care he deserves the same respect, compassion, understanding, and love as you would give another human. 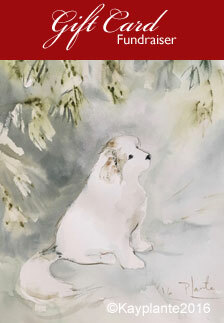 The one great thing you must understand about a Pyr is that being your guardian is his sole reason for living. Therefore he needs to be with you. Indoors and with outdoor activities. You cannot reasonably expect him to stay outside during the high temps you are experiencing, tied, just watching the chickens. If you do not understand what this is doing to your Pyr, you should not have him. His lovely big head contains a very complex brain so he's thinking and assessing all the time. He may be a great big goofy but he's also incredibly sensitive, intuitive (empathic) and compassionate. The decisions made to pass him around, to cut his hair, tying him up, expecting him to be some kind of automatic mechanical wind-up protection device is cruel at best and abusive at worst. 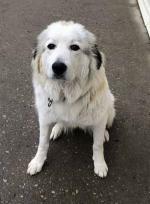 If reading up about the Pyrenees on this very informative site has not educated you enough that you are still questioning how to treat him, then you must consider relinquishing him into a Pyr Rescue. 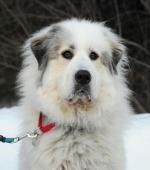 And I do specifically mean a Great Pyrenees Rescue. They have the knowledge of this unique and amazing breed and will rehabilitate him. I hope its not too late.